The times are not just a-changin’, they’re a-revolutionizin’! As social media becomes increasingly present in our everyday lives, a major democratic cultural shift is underway. Through the power of relationships, sharing of experiences, and organizing online, previously marginalized voices are pouring into and shaping public conversations like never before. But serious change will not happen on its own. Despite the increasing presence of a diversity of voices and faces, the Internet isn’t fulfilling its disruptive potential; more often than not, it’s simply replicating and amplifying inequality and segregation. The good news? 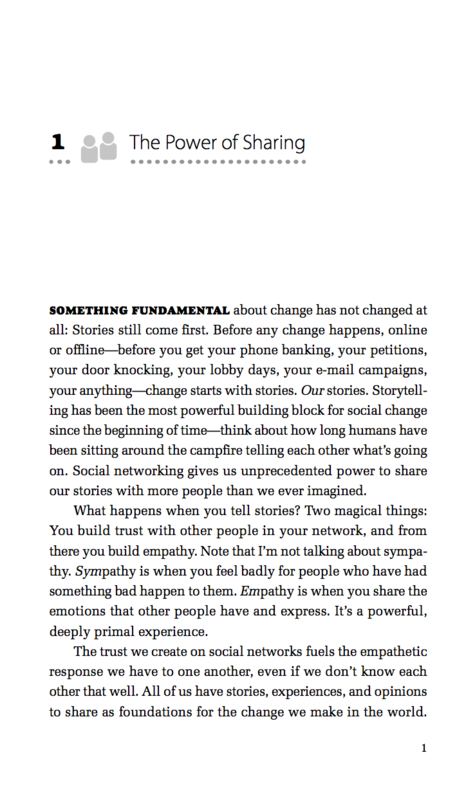 The fundamental building block common to every social movement is the power of the narrative. 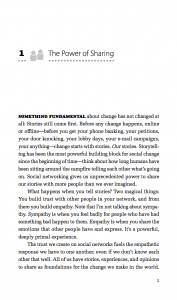 Your story… and your willingness to share others’ stories with your networks… can mean the difference between progressive change and perpetuating the status quo. We need you here, building and mapping your relationships, sharing your experience and creating pipelines of empathy and trust that will change the world. Amazon Powell’s Barnes & Noble * Digital and paperback versions at each site. Also available on Indiebound. Size Doesn’t Matter. Relationships Do. Ready to test the waters? Download a sample. What people say about Share This! If you are an activist or a concerned citizen and you are new to social media, start with Share This! Deanna Zandt has deep knowledge, broad experience, a knack for clear and simple explanation, a talent for storytelling, and a wonderfully engaging voice. 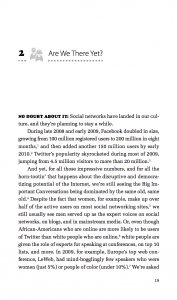 Deanna Zandt is right on target–social media is a new frontier for social justice. The world may indeed be a better place if we all tell our stories authentically and fearlessly and listen to one another with open hearts. This book is perfectly timed and brilliantly balanced between reality and inspiration. Social media won’t change the world on its own but with active, informed and conscious participation we can. Greedheads and boneheads, arrogance and ignorance. Can everyday people buck the system? Yes! Zandt shows us how, and how to have fun doing it! Deanna Zandt has a techie’s brain and an organizer’s heart. With this book, she shows us definitively (and entertainingly too) how our personal stories can do more than fill out our consumer profile. Together, they say, we can change the world. Deanna shows us how we can come together in a whole new way, right now. Share This! is the book I wish I had written. Zandt writes with incredible knowledge, easy humor, and profoundly touching stories. 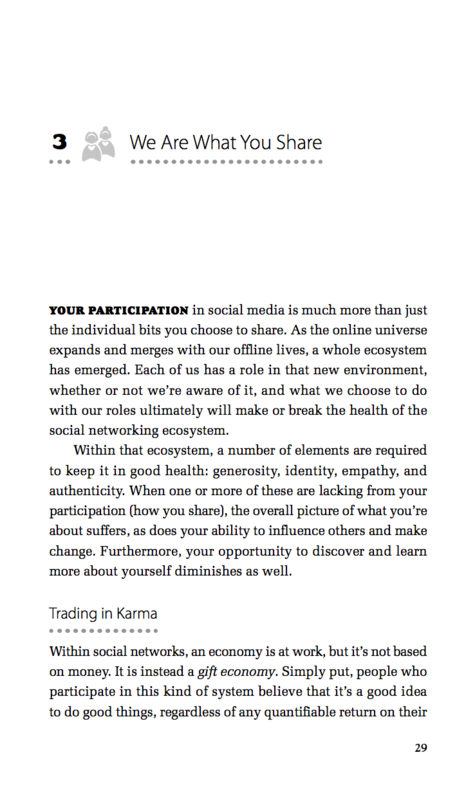 If ever you needed that nudge to convince you that the web has fundamentally changed the game and that your participation is an important part of it, this is the book. I’m recommending it to everyone I know. Progressive media activist and ‘geek grrl’ Deanna Zandt has been surf- ing the social media wave practically from the start. Whether you’re looking to get your feet wet or want to dive in, Share This! shows not only how networked media is changing society but how we all can join in and make the most of it to help change the world. 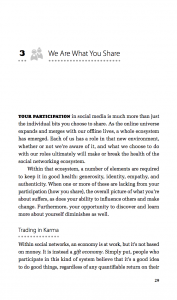 Anyone interested in social media for social good needs to read this book and absorb the techniques and stories for using the tools that Zandt shares. 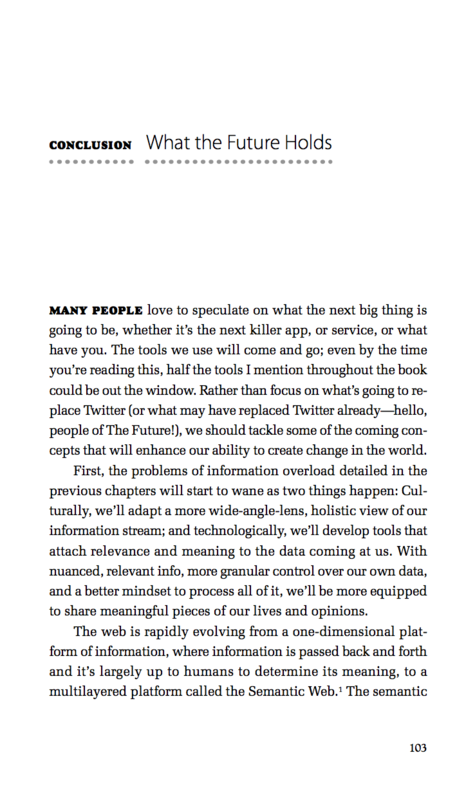 Sick of hearing about how social media is changing everything? 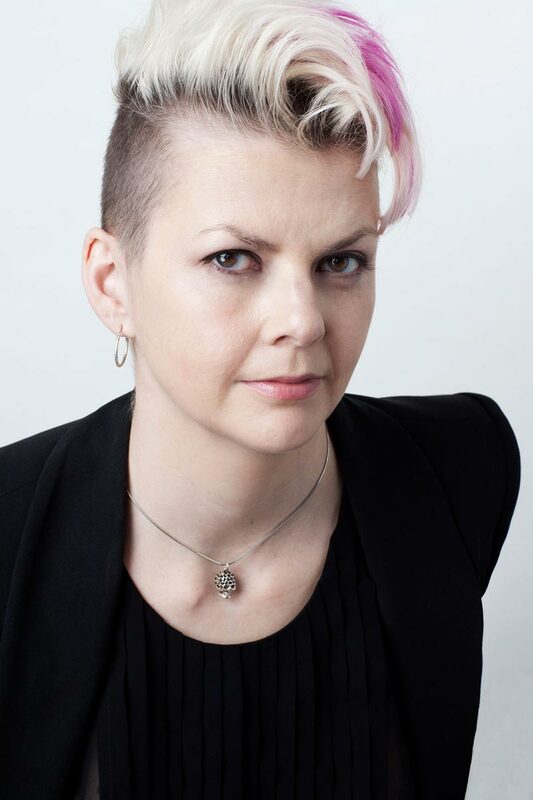 Deanna Zandt knows what you mean–and yet she’s found a way to transcend the cynicism and remind us that beneath the hype, some- thing amazing is happening as we build our digital lives around what still matters most: relationships. Share This! 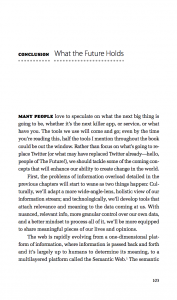 is a book that everyone from tech novices to old hands will enjoy. 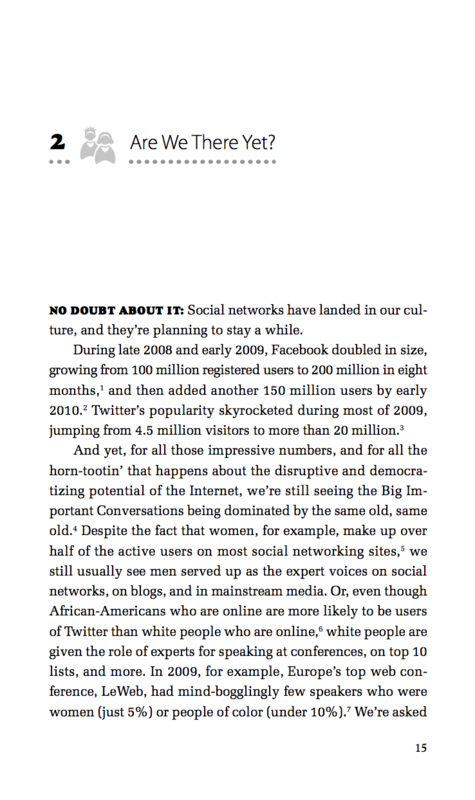 Zandt hits just the right note with her accessible and witty prose–this book is bound to change the way you think about social networking. Deanna Zandt is completely tapped into the social media matrix. 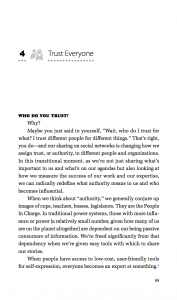 Every activist working in the digital space needs this book. Deanna Zandt has a unique talent for bringing clarity to the too often jargon-y and confusing discussion of how new technology is changing society. Share This! 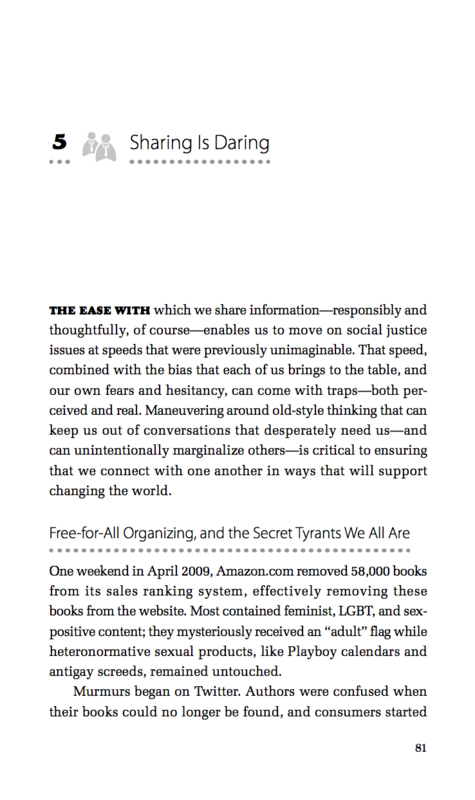 is a must read for anyone wanting to understand how to navigate the new hyperconnected world of media and activism. With media, technology, and politics having essentially merged, all activists for justice need to update their attitudes and their skills. 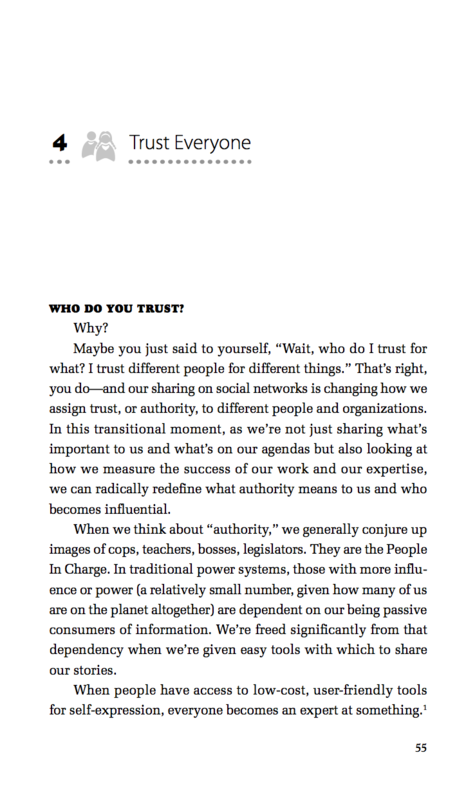 This book by social media maven Deanna Zandt has just the right mix of the why and the how to convince the skeptical and equip the fearful. Deanna Zandt thinks big, arguing that social media won’t just change how we talk but how we live. Part analysis, part guidebook, Share This! offers a creative, ambitious view of a truly organic political landscape hinted at, but never really pursued, by the new political establishment. 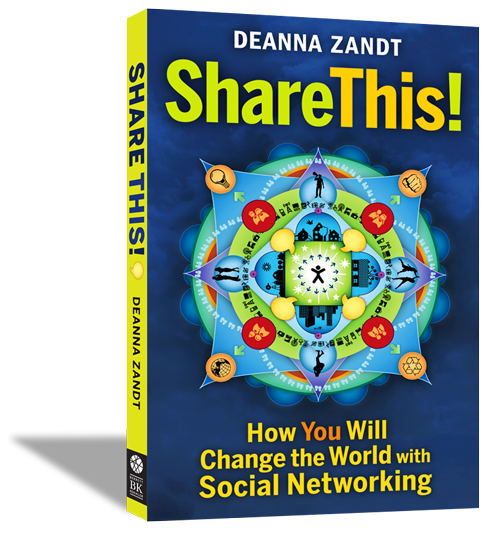 Deanna Zandt is one of the smartest, savviest, and sharpest observers of the new world, new media, and new ideas. Share This! combines common sense, technically savvy how-to, and a grasp of the way in which human beings and technology come together and sometimes apart. Deanna Zandt is a first-rate guide for the 22nd century. Where to buy Share This! * Digital and paperback versions at each site. Also available on Indiebound. All the following tour dates are from 2010. For current appearances by Deanna, see deannazandt.com/events. RSVP at the Facebook invite. After-party at Konak, sponsored by Drinking Liberally, 8:30pm-? RSVP at the the Facebook invite. June 14: Official release day! June 17, 7pm: Rooftop Tech Talks, Brooklyn, NY. Free beer! Woo! See the Meetup page for info. July 20, 6pm: San Francisco Launch Party, Benders Bar & Grill. Sponsored by AlterNet.org! Light appetizers will be served. 806 S Van Ness Ave, San Francisco, CA. RSVP at the Facebook invite or on the Eventbrite page. 2251 Chestnut St, San Francisco, CA. Book signing: Fri, Jul 23, 10am. Location TBD. Party: Fri, Jul 23, 6:30-8:30pm Masquerade Suites; Room TBD. Sponsored by AlterNet, Firedoglake and the Women’s Media Center. July 28, 7pm: Reading, Barnes & Noble, Binghamton (Vestal), NY. Sept 15, All day. Women Who Tech Teleconference. On the Web: attend from anywhere! Sept 23-25: Panel, Facing Race Conference. Chicago, IL. Oct 6-7: Panel, Deutsche Telekom Innovation Day. Berlin, Germany. 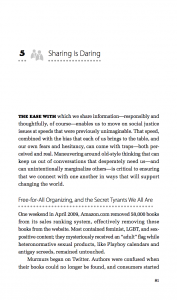 Talk: The Power of the Internet to Address Issues of Race and Class.